It's been a month and a lot of bugs have been fixed in that time and new features added. That adds up to time for another EA for our new sqlcl. The third sqlcl EA is out now and can be found here on the SQL Developer 4.1 download page. Not sure what this sqlcl thing is ? Check here. The output from running the script makes it very easy to see what happened. This is another very simple yet useful command. The idea is to basically build your own sql that your may want to run to see what's going on. This example is a simple select against v$session with a decode on the command to see what the sessions are doing. Running this is easy, running it again and again mean hitting / and return a lot. Enter the repeat. 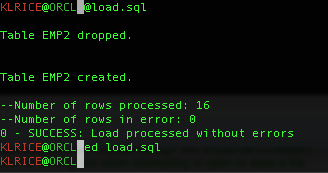 Just specify how many times and what the sleep interval is and sqlcl takes care of running it. In the header, there's a status to who what iteration it is what the time is ( and yes I know a bug in the number format ) and what the delay is to running it again. The SQL I'm using here is the same sql in the SQL Developer Sessions report. It can be found off the Tools->Sessions menu. Additionally in the Reports section under DBA reports.